FGF-19 - Research Abstracts, Kits Standard Curves, Sequences, etc. Wu X, et al., Proc Natl Acad Sci U S A. 2010 Aug 10;107(32):14158-63. Epub 2010 Jul 26. Action mechanisms of hormone-like Fgfs and regulatory mechanisms of their gene expression. (Fgf15) Intestinal Fgf15 expression is regulated by bile acid produced in the liver. The ligand-bound FXR forms a heterodimer with RXRs and induces the expression of Fgf15. The Fgf15 suppresses the expression of Cyp7a1 in the liver by activating the βKlotho-Fgfr4 complex. The regulatory process forms a negative feedback loop in the regulation of bile acid homeostasis by Fgf15. (Fgf21) Hepatic Fgf21 expression is induced by the activation of PPARα. NEFA binds to and activates PPARα. The ligand-bound PPARα forms a heterodimer with RXRs and induces the expression of Fgf21. A) GAL-Elk1 luciferase assay in rat L6 cells. L6 cells were cotransfected with expression vectors for KLB and the indicated FGFR together with GAL-Elk1, SV40-renilla Luciferase, and Gal-responsive firefly luciferase reporter. Transfected cells were incubated with media containing increasing concentrations of FGF19 (○) or FGF21( ) for 6 hours before luciferase assays. Transcriptional activation was assessed by the relative firefly luciferase activity normalized by renilla luciferase activity and expressed as relative luciferase unit (RLU). (B) Drawings (to scale) of FGF19 (top), FGF21 (bottom), and various chimeric proteins with amino acid composition at left. Based on the results of repeated GAL-Elk1 assays such as shown in (C), each chimera was classified into class (I), (II) or (III) as indicated at right (see text). 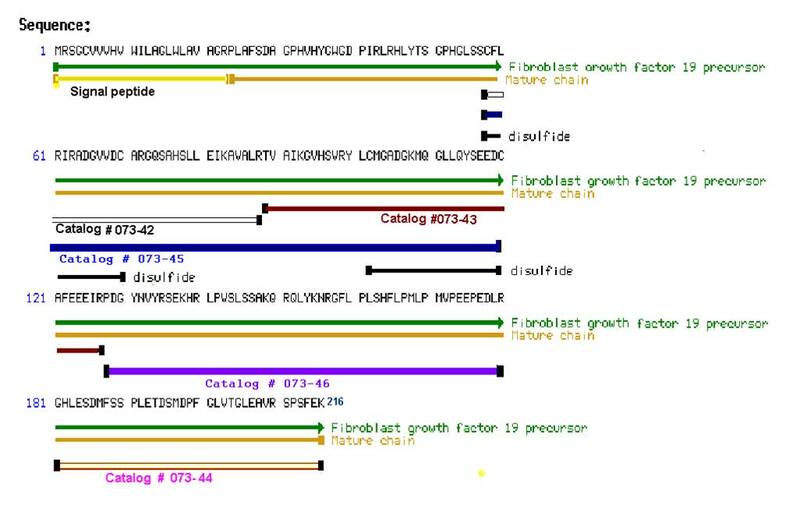 Chimeras which did not exhibit an equivalent FGFR1c activity to FGF21 or FGF19 when conditioned medium was used were not shown here. (C) Representative results of GAL-Elk-1 assay for chimeras shown in (B). L6 cells were cotransfected with expression vectors for KLB and/or FGFR as indicated at right. Each FGF construct was expressed in transiently transfected 293 cells and the conditioned medium was used in the assay. The results are shown as a fold induction over control media conditioned with mock transfected cells. (D) Similar to (A). 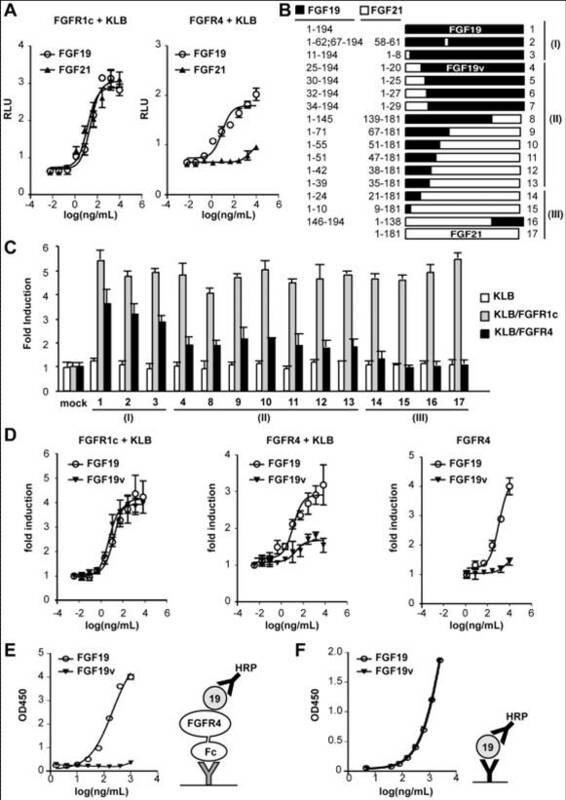 Purified FGF19 (○) and FGF19v ( ), (the construct #4 in (B) and (C)), were tested for FGFR activation in the presence or absence of KLB coexpression as indicated. (E) Solid phase binding assay of FGF19 and FGF19v to FGFR4 fused to Fc fragment was tested as described in the method section. Schematic diagram for the experiments is shown at right. Bold Y indicates antibody against FGF19 (black) or Fc fragment (gray). 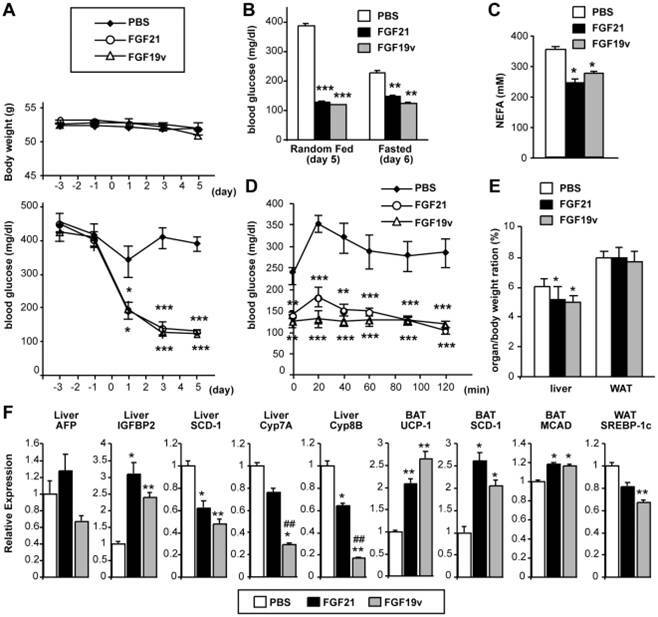 HRP: horseradish peroxidase F) A control ELISA experiment to show that anti-FGF19 antibody used in (E) recognize FGF19 and FGF19v at indistinguishable affinity. 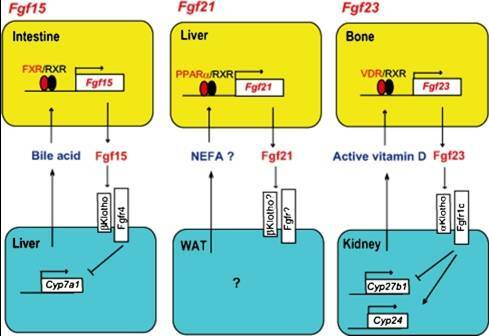 Fgfr4 is required for BA regulation but not for improvement of glucose tolerance by FGF19. (A) WT and KO mice on high fat diet for 6 weeks were implanted with an osmotic pump to infuse FGF19 at 1 ng/hr (day 0). On day 6, overnight fasted mice were subjected to glucose tolerance test with i.p. injection of glucose at 1 g/kg. *p<0.05. **p<0.01. p value for area under the curve (AUC) was p<0.02 (WT) and p<0.005 (KO). N = 6~8. Note that fasting blood glucose levels were significantly higher in PBS-treated Fgfr4 KO mice compared with WT mice (#p<0.01). (B) Metabolic parameters at euthanasia on day 7. Mice were euthanized and serum prepared after 3 hr fast. N = 6~8. 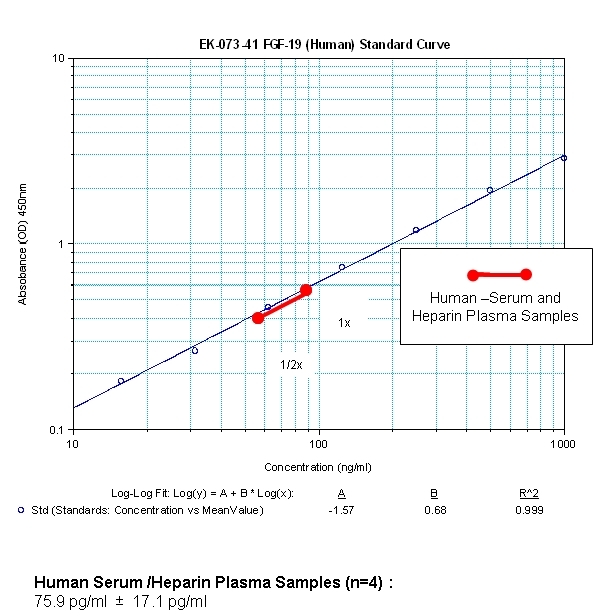 (C) Serum BA composition analysis. Only major BA species are shown. CA: cholic acid, DCA: deoxycholic acid, MCA: muricholic acid, T-:taurine-conjugated. ^: undetected. (D) Hepatic gene expression determined by real-time qPCR. N = 6~8. p values for (B), (C), and (D): <0.05, **<0.005 (PBS vs FGF19), #<0.05, ##<0.005 (WT vs Fgfr4KO). 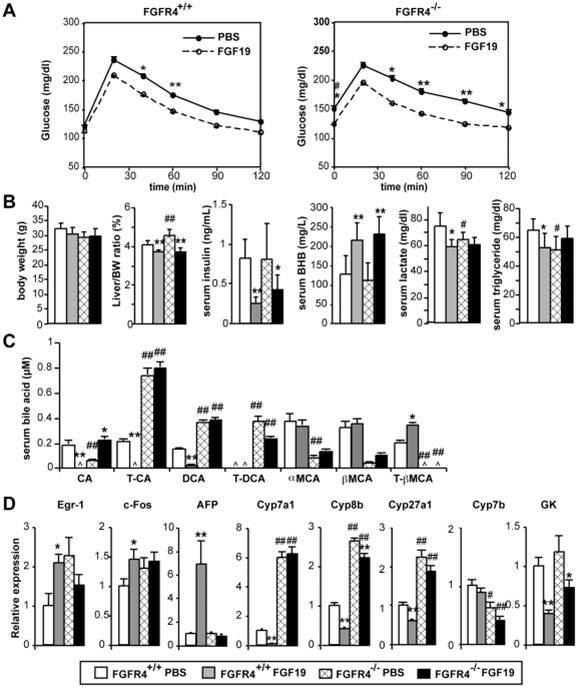 FGF19v and FGF21 exhibit similar metabolic effects and ameliorate hyperglycemia in ob/ob mice.